We spent five days in the lovely town of Horta waiting for the winds to return, which they never did. Despite our anticipation as we were already more than three weeks behind schedule, we enjoyed our stay enormously! 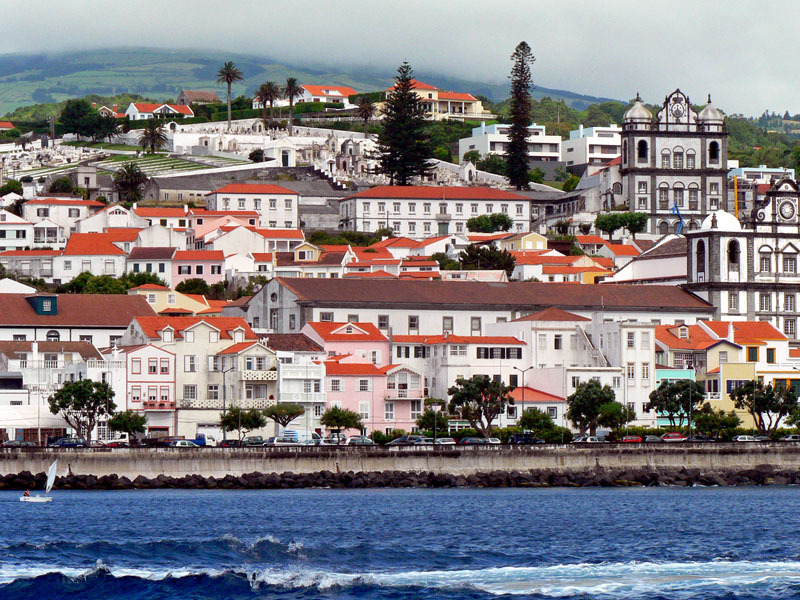 Although we had been to Faial before in 2003, we rented a car for a day and toured this beautiful island once again. It was as if we were driving along the paths of a lush garden as the roads were lined with luxuriant foliage, and the fields hedged with magnificent blue hydrangeas. 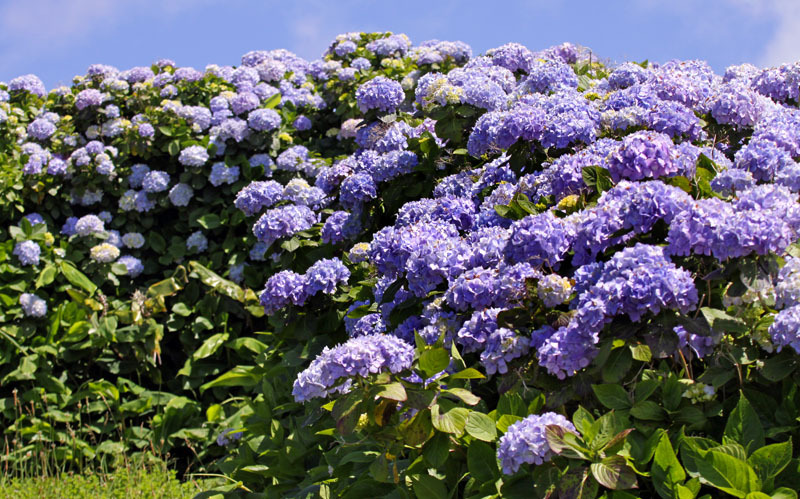 The hydrangeas are perhaps the best known feature of the Azores, and have given Faial its nickname Ilha Azul i.e. Blue Island. The pant was originally introduced from China in the 18th century, and has since become naturalised. It is often thought that Horta was named after the plant's Latin name, hydrangea hortensia, although Horta actually owes its name to one of its early settlers, Joste van Huerter. 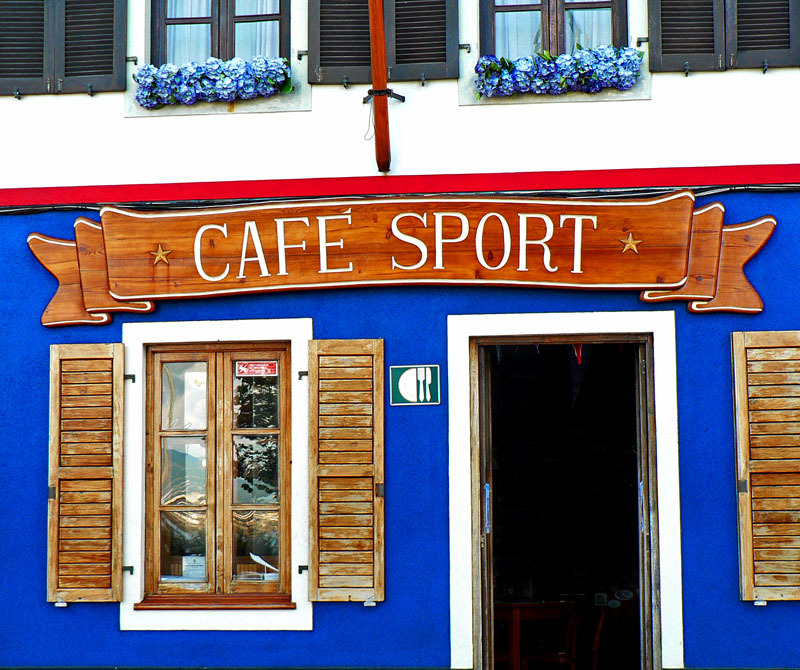 During our stay, we dined, wined and socialized at the legendary Peter Café Sport, elected the world's best bar for sailors in 2009. Ever since it was founded in 1918, Peter Café Sport has been a safe haven for sailors crossing the Atlantic. 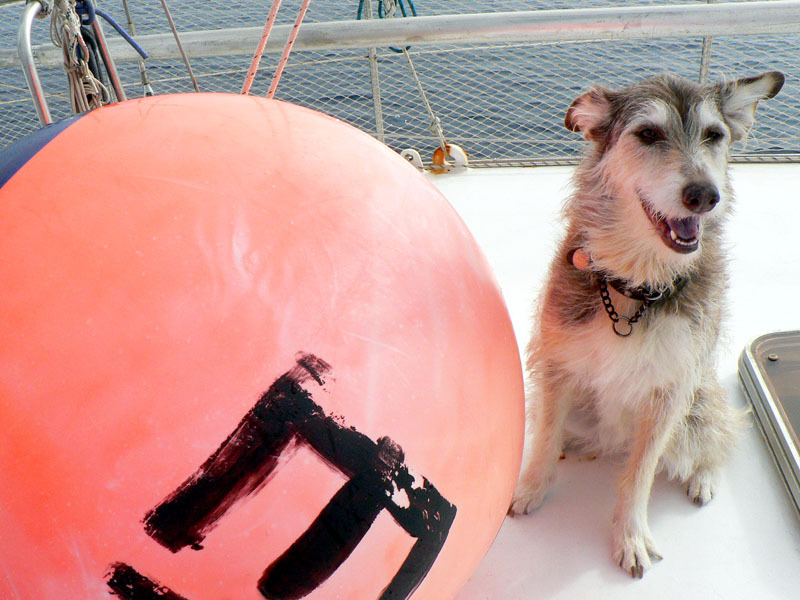 It's a bar, a restaurant, an information office, a weather forecaster, and sometimes even a charity organization, and therefore it has become a symbol of friendship for sailors from around the world. Besides, it has perhaps the cheapest G&T's of the whole Atlantic! 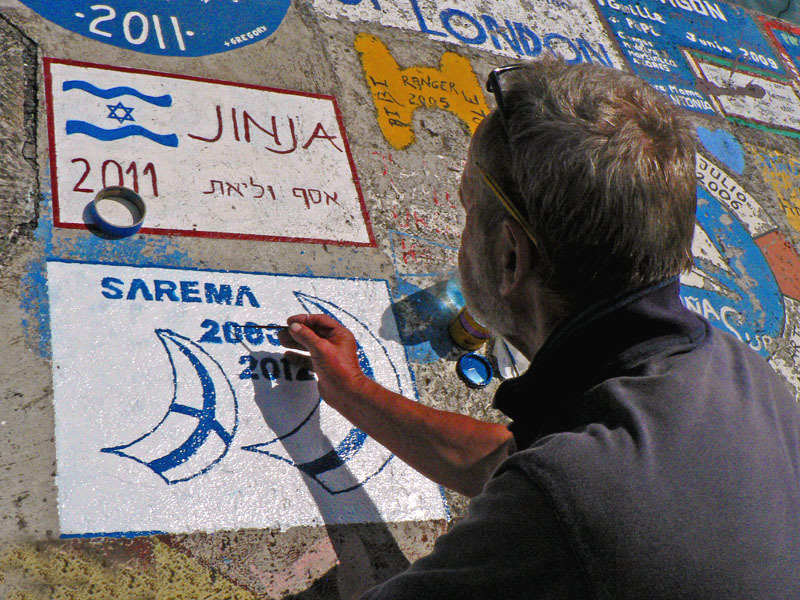 Since we had plenty of time to spare while waiting for the winds to pick up, we decided to leave our mark in Horta. Pekka volunteered to do the job which required a steady hand and artistic skills. 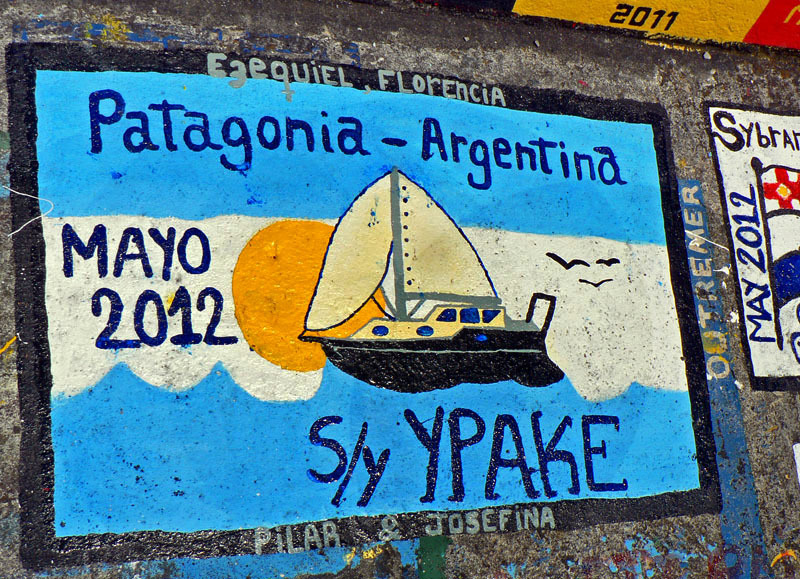 While Pekka was acting the artist, Latte and I went for a walk and, amongst the hundreds and hundreds of works of art that cover every available inch of the concrete quays and walls of the marina, we spotted several made by our sailing friends and acquaintances from different parts of the world. As the weather forecast continued to promise nothing but flat seas and sunshine for the foreseeable future, we didn't have the patience to wait any longer. On the 17th of July, we said 'Adios' to Horta and embarked on our final leg of the season, this time equipped with enough fuel to take us all the way to Lagos, Portugal, if need be. 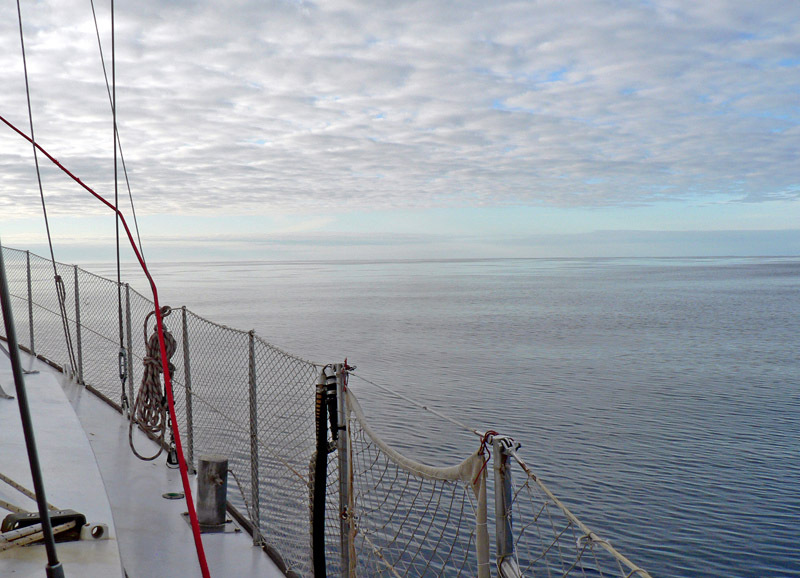 Till the 22nd, the ocean surface was as smooth as silk, but it had its benefits too. 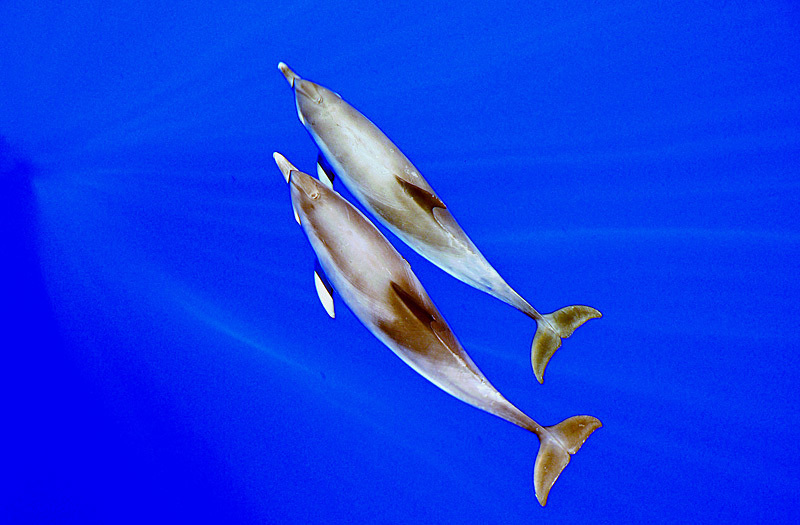 Thanks to the calm seas and sunshine, dolphin watching and photographing was utterly enjoyable! On the 23rd, as we neared the periphery of the high pressure area, we finally found the winds that had been avoiding us so far. To celebrate the occasion, we put Amalia Rodriquez on, and as we enjoyed the good music, the good winds and, as usual, the good food, we could see, in our mind's eye, the majestic cliffs of Cabo de Sao Vicente rise from behind the horizon. Henceforth, it was going to be plain sailing all the way to Portugal - or so we thought. On the 24th, around noon, we heard a LOUD BANG!! 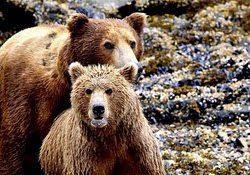 !, and after a few seconds' confusion as to where the sound came from, we saw that once again the culprit was the forestay. This time it was the chain plate that had broken. The forestay with the Furlex was swinging loose, and all the 75 square metres of sail were flapping uncontrollably in the wind. 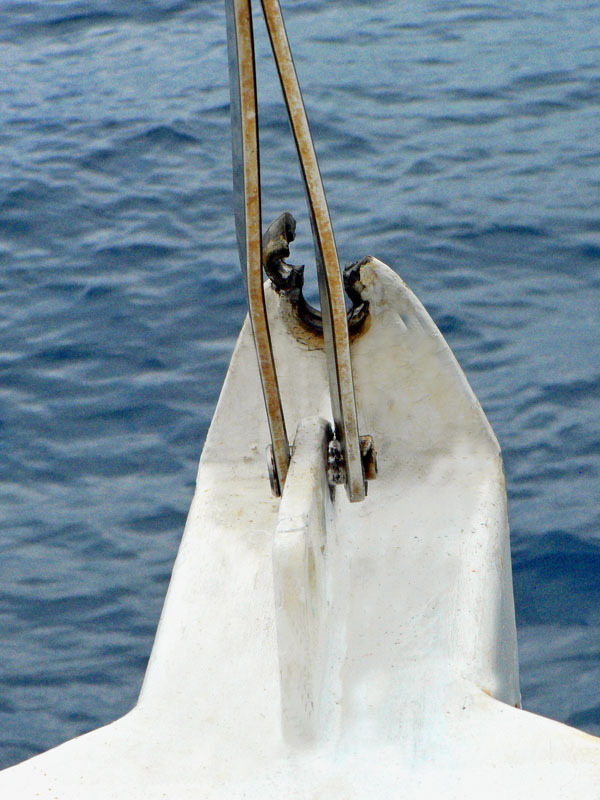 During a single season, in addition to the numerous technical and other problems we have encountered, we have managed to rip our cruising chute, break the inner forestay, and now this! Although there was absolutely nothing we could have done to prevent any of these incidents, it doesn't make us feel any better. 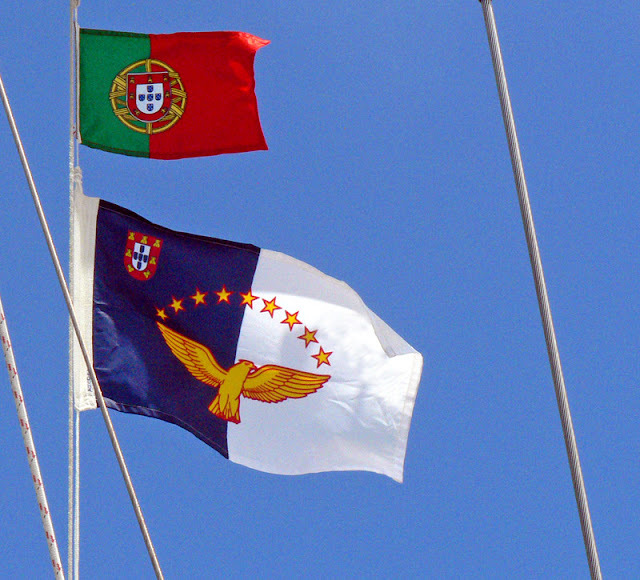 Now, as we only have about 200 nautical miles to Portugal, we most sincerely hope that this was the last mishap of this incredibly unlucky season! Contrary to what we had hoped for, our run of bad luck continued! 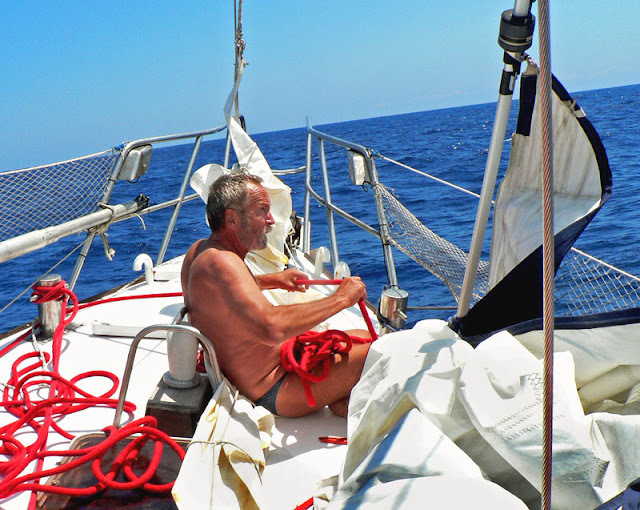 On the 25th, while happily motor-sailing towards Portugal in moderate winds, when changing shift at 4 am we noticed that our speed was dropping, and was soon less than three knots. This time the source of the problem was the transmission, the same transmission that was repaired in Buenos Aires just three months ago. According to Pekka, we could now use the engine in reverse gear only, whereas going forward was impossible. As this information was a bit too much for me to cope with under the circumstances, I went straight to bed and told Pekka not to wake me until we were in Lagos! Pekka, persistent as he is, continued trying to solve the combined problem of no forestay and no transmission. When I woke up a few hours later, Pekka told that the transmission couldn't be fixed at sea but that he had managed to reinstall the forestay, and we were back in business. We are now making reasonably good progress, but what will happen when we reach the south coast of Portugal where the winds are expected to abate, and how we are going to get into the marina remains to be seen. So, stay tuned! While drifting, a group of Atlantic Spotted Dolphins came for a visit but as we were not actually moving anywhere, they soon lost interest in us. 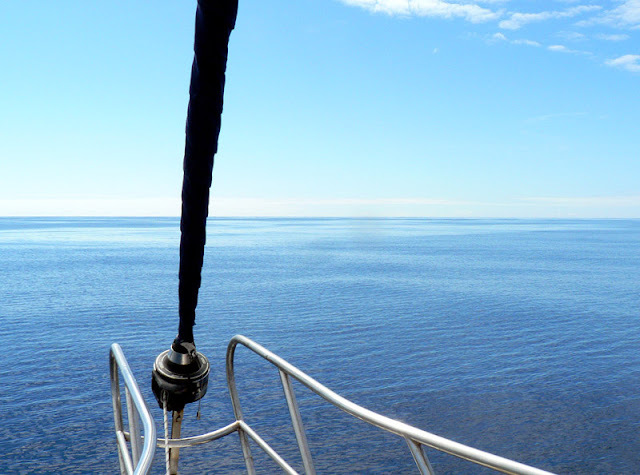 Below is a photo that shows how flat calm the seas were in the windless Azores High. Luckily, on our second day of drifting, contrary to all predictions the wind picked up a little, and with the help of the fuel we had saved for an emergency, which was of course there and then, we managed to reach Porto das Lajes in Flores. The following day, the wind brought four other boats from the Atlantic, among them the Norwegian boat with four extremely happy sailors on board. In Lajes, we bought 140 litres of diesel in jerry cans which we dinghied to the boat, and the next day, continued our journey to Horta, Faial, which was our original destination. Today, at 7.30 pm, we had to turn off the engine to save fuel. We are now about 400 nautical miles to the north-west of Faial which is less than four days of sailing or motoring but as we have neither wind nor fuel, there is not much we can do to improve our situation. We are currently drifting in the middle of the Atlantic in a weak ocean current and the almost non-existent wind at the speed of one to two knots, and anxiously waiting for the wind to pick up. 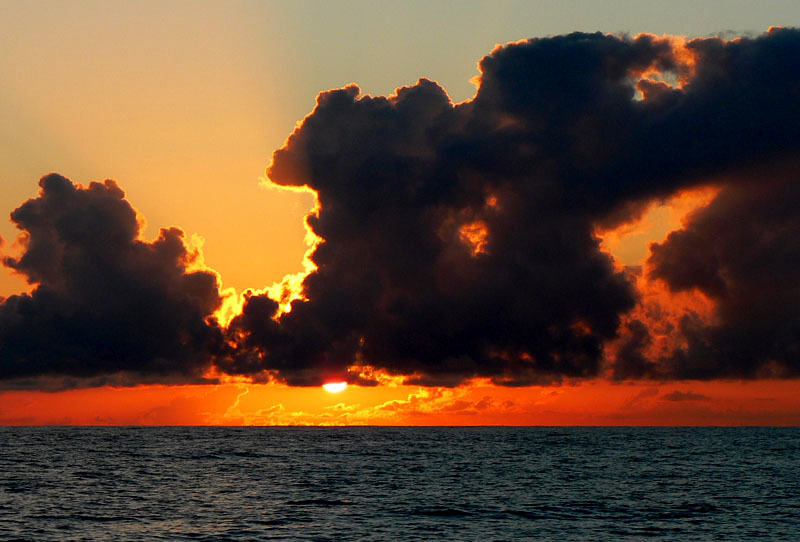 When we left the Caribbean on the 16th of June, there were three major high pressure areas on the northern Atlantic, beginning from the coast of Florida and extending across the ocean all the way to the coast of Africa. So, it seemed that right from the start, we were doomed to fall victim to the infamous Azores High. For the first week, the sailing was good but after that it was more or less motoring or, if we were lucky, motor-sailing. As our speed eventually began to drop, and our daily mileages were reduced accordingly from 130 to 98 to 73 to 62 to 57 nautical miles, it was two weeks to Horta, day after day after day after day. For the whole of the second week, except for Sargasso weed, we had nothing: no birds, no fish, no wind, NADA!, and we were bored stiff. During our third week though, although the winds were still mostly absent, we caught a good size mahi-mahi, had numerous sightings of whales, and several groups of dolphins came to entertain us. One day, there was something swimming alongside our boat that I first thought was a small dolphin. But as it didn't surface at all, I soon realized it had to be a fish. After a while, this something made a drastic U-turn and jumped out of the water in pursuit of a flying fish, and I saw that it was a huge tuna! After catching the flying fish, it resumed its place along the side of our boat. Why it did this, I have no idea, but I found it extremely fascinating. The tuna remained there for the rest of the day, and I lost sight of it only after the sun was setting and there was no more enough light to penetrate the water. For the past fortnight or so, we have also been mesmerized by two super-bright lights that rise from behind the north-eastern horizon at dawn when all the other lights in the sky are already fading. We think they are the planets Jupiter and Venus but of this, we are not absolutely certain. Our current position is 39° 30,678' N, 40° 09,338' W, we have about four knots of headwind, and the barometer reading is 1033 mb, which means that we are practically in the centre of the high pressure area that has hindered our progress for the better part of our ongoing voyage. 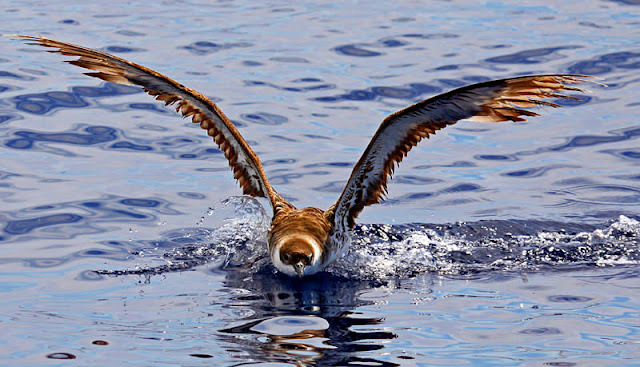 We still have about 540 nautical miles to go but as we are gradually running out of fuel, we'll need decent winds for at least two days in order to reach Horta. I must admit that I'm a bit concerned about our situation at the moment. 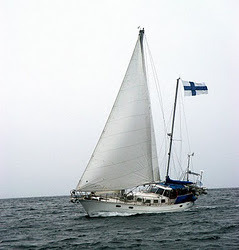 The other night, a Norwegian sailing boat contacted us by the VHF. They told us that they had about 20 litres of fuel left for emergency purposes and that they had been drifting for the past ten days with four people on board. We gave them the latest weather forecast which had nothing positive in store for them. I do hope they'll hail the next cargo ship and ask for fuel! Since we've had ample time on our hands lately, we have taken up 'fender spotting and collecting'. The jewel of our collection is now a gigantic fender probably conveyed by the Golf Stream from the US coast. 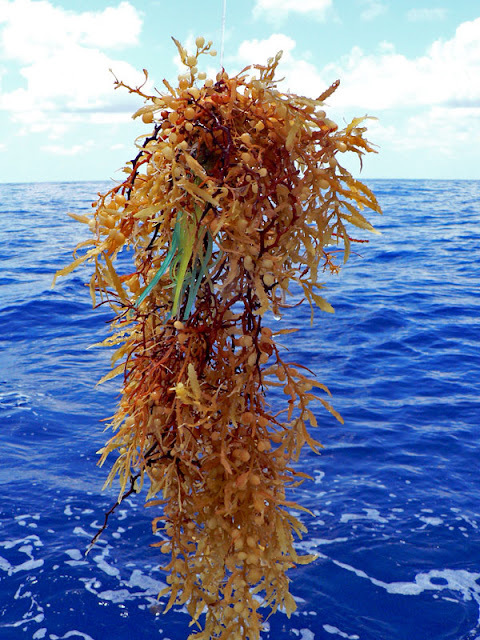 We've also been surveying the state of the ocean, and have come to the sad conclusion that most creatures of the sea have but two options, either to learn to eat and digest plastic, or to perish. What a fantastic leg from Salvador Bahia to Le Marin, Martinique! During our last week at sea, we broke our previous records of both mileage in 12 hours and mileage in 24 hours, which are now 102.1 nm and 203.8 nm respectively. That's pretty good considering the dimensions and weight of our good boat Sarema who is by no means a racer. 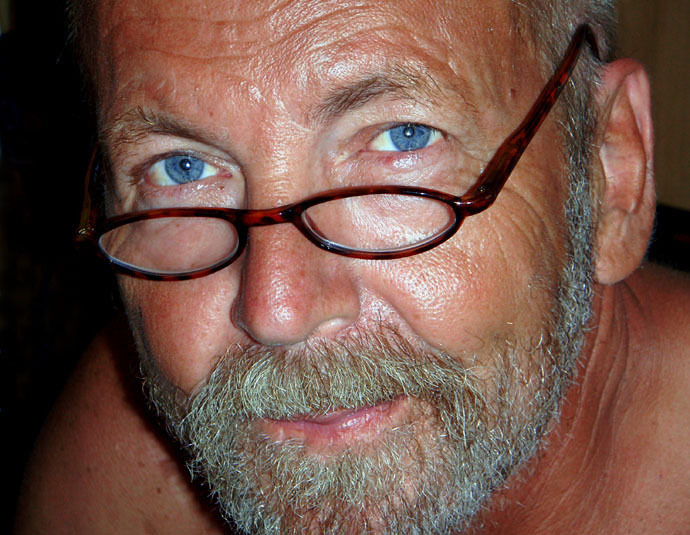 When heading south, it took us exactly one month to sail from Trinidad to Fortaleza, Brazil, and now, thanks to the same winds and currents that made our lives downright miserable at the time, it took us only 19 days to sail all the way from Salvador to Martinique. 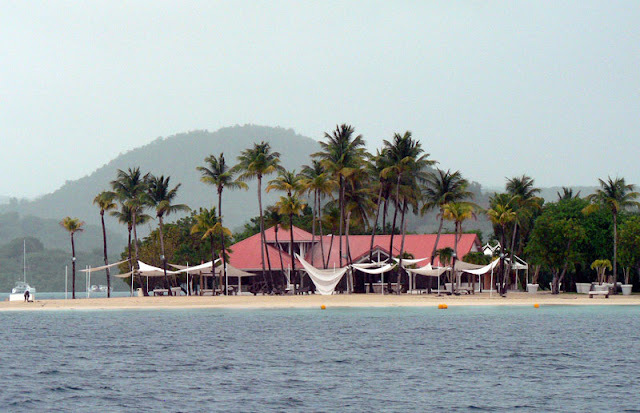 We left Buenos Aires on the 28th of April and arrived in Le Marin, Martinique, on the 11th of June. Of the 44 days, we spent 40 days at sea during which we made a total of 5036.4 nautical miles, 126 miles a day on average. 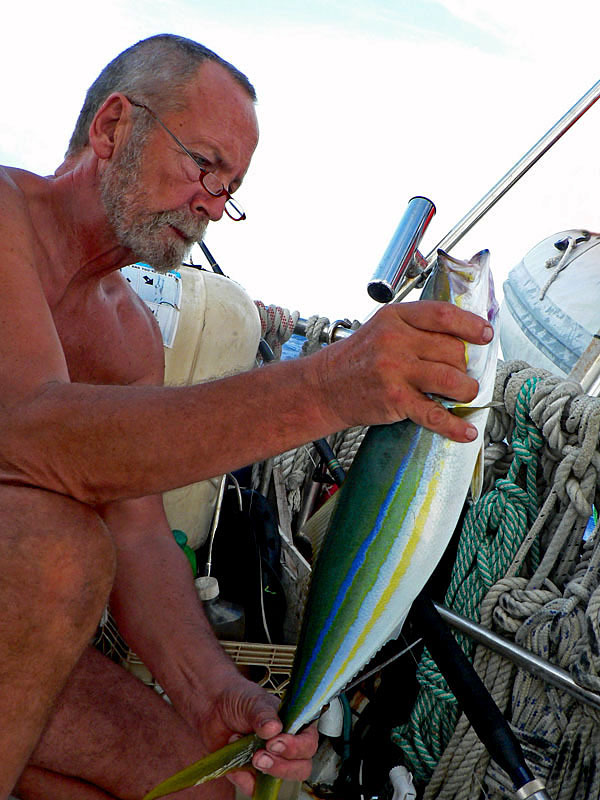 It looks like we are back in favour not only with Ilmarinen, the ancient Finnish God of the Winds, but also with Ahti, the God of the Seas, as we finally managed to catch a fish. And this time it was a proper fish, both tasty and beautiful, although of a species unknown to us. We'll stay in Le Marin for just a few days to refuel and reprovision and then, by tradition, stop at Petite Anse D'Arlets for a day of snorkelling before we leave the Caribbean waters behind. Next, we'll make our landfall in Horta, the Azores, where we should be at the beginning of July, provided we manage to avoid the Azores High.